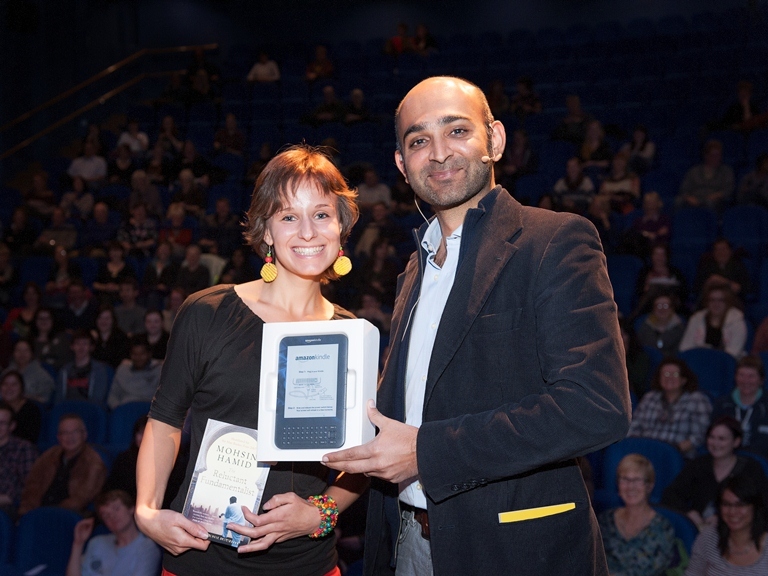 Mohsin Hamid presenting prize to first year Slovakian student, Andrea Linhova. Multi award-winning author, Mohsin Hamid, visited the University of Stirling recently, as part of the Booker Prize Foundation’s Universities Initiative. Hamid, whose bestselling novel The Reluctant Fundamentalist was shortlisted for the Man Booker Prize in 2007, had travelled from Pakistan to inspire and entertain his audience, by reading from his work, discussing his life and career, and participating in a question and answer session. Stirling is one of only a small number of universities in the UK to take part in this prestigious initiative. Created to introduce students to high quality, contemporary fiction, and to promote the art of literature, the scheme allows students across all disciplines to share a common experience. In Stirling’s case, Mohsin Hamid’s novel brought the whole campus community together and generated many hours of stimulating debate and discussion. Stirling’s first year students received copies of the novel during Freshers’ Week and attended reading groups in preparation for the author’s visit. Additionally, History & Politics and Creative Writing students were treated to a guest appearance by the author and were delighted by his visit to their classes on the day of the event. The event, which was attended by an audience of over two hundred people, also attracted members of the public and pupils from local schools, including Bannockburn High, Balfron High and Larbert High. At the end of the event, a special prize draw involved Mr Hamid presenting a Kindle reader to winner Andrea Linhova, a first year studying English and Film & Media. The Booker Prize Foundation’s Universities Initiative was launched in 2008. For universities participating in the scheme, every first year student, regardless of course of study, is given a Man Booker Prize shortlisted title at the start of the autumn semester. Students are also invited to attend a free special reading event with the chosen author. The scheme is jointly funded by the Booker Prize Foundation and the individual universities involved.